Irish Record 4lb 14.5oz taken on 19.03.1981 by M.J. O’Connor at Kenmare Bay. The lateral line is high on the body and curves upwards towards the large eyes. The upper jaw protrudes the lower jaw. The belly is silvery-white leading on to silver flanks and a beige-green back. As with all members of the Cod family, Whiting are equipped with three large dorsal fins. They have a set of tiny, needle-like teeth. 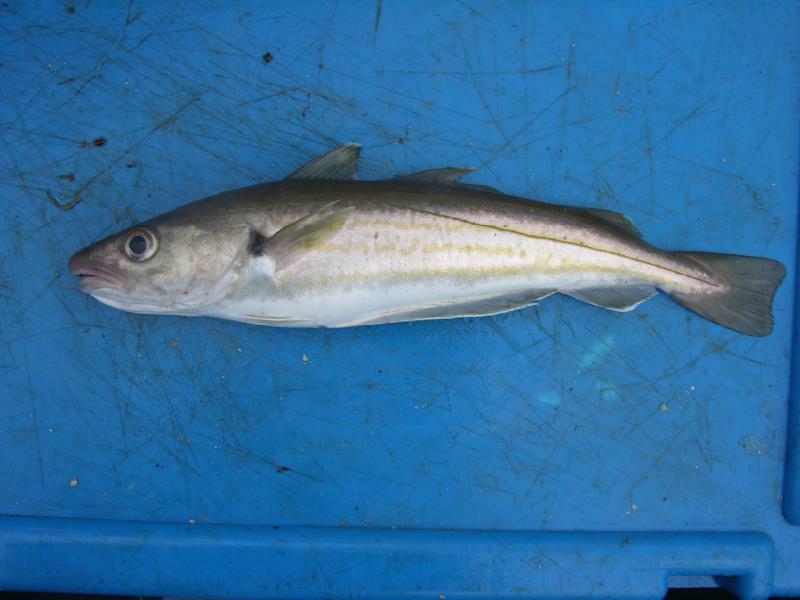 Whiting can be found all around the coast of Ireland in reasonably large numbers, but usually of a small-juvenile size. They prefer deeper water in summer but move closer inshore during the winter months when shore fishing can become hectic at times, although fish of over 1lb are difficult to find in many cases. The East coast below Dublin can offer good Whiting fishing, but nearly all the larger, specimen Whiting come from sand banks off the Cork coast. East Ferry, Cobh, Crosshaven, Kinsale and Dungarvan are all harbours that offer charter boats or launching facilities to reach the off-shore marks in search of specimens. The Beaches in Youghal can be superb for shore caught whiting throughout winter. When boat fishing, Whiting are available most of the year. When the sea temperature drops during the winter months, shoals of Whiting make an appearance inshore, and are then within easy reach of the shore angler. It is usual to target this species during the hours of darkness, when Whiting are herding bait-fish and sandeel towards shore and are confident enough to venture closer to shallow water. Whiting will take almost any natural bait offered, including Ragworm, Lugworm, peeler crab, Sand eel, Mussels and fish baits. Fish over 1-2lb are considered exceptional from the shore, so baits do not need to be too large when targeting this fish. On the off-shore marks, most fish are taken on baited Mackerel traces or flowing traces in search of flatfish. Baited feathers or spoon rigs work well when boat fishing and luminous beads help as attractors when shore fishing. Hooks from size 1 to 2/0's cover all whiting fishing but strong hook patterns are advisable, as large cod are sometimes caught amongst Whiting shoals. Flowing traces should be kept short, with plenty of swivels attached when specifically targeting Whiting. They have a frustrating tendency to tangle your rig snoods!